Presidio Brass in Duncan, the Heart of the Chisholm Trail, to perform this month. 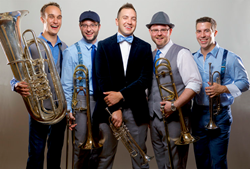 DUNCAN – Through the generous sponsorship from Arvest Bank and Duncan Area Economic Development Foundation, CTAC Live will bring Presidio Brass to the Simmons Center Theater, Duncan on Thursday, January 31st at 7:30 pm. Since forming in 2006, Presidio Brass has rocketed to success as the face of a bold new generation in brass entertainment. By combining a brass quintet, piano and percussion with fresh, original arrangements, their unique sound has become a trademark for the ensemble from San Diego, CA. Presidio Brass has performed throughout the U.S. in over 40 states as well as internationally in Canada and China, conducted master classes at many of America’s finest universities and been featured on National Public Radio. In 2017 they partnered with the music education giant KHS America/XO Brass/Jupiter Musical Instruments, making them the flagship ensemble of Jupiter Musical Instrument and performing exclusively on XO Brass instruments. Later in 2017, the group worked with KHS America and VH1 Save the Music Foundation to bring music education and instruments to New Orleans. Members of the ensemble have performed with major symphony orchestras, including the Los Angeles Philharmonic, Las Vegas Philharmonic, Pacific Symphony, San Diego Symphony and Missouri Symphony Orchestra. When not on tour, they continue to perform with orchestras, maintain private teaching studios at local universities, arrange and compose new music, assist with public school music programs, and operate an annual summer music camp for students of all ages. Inspired by the dedication of their school music teachers, Presidio Brass came together with the primary mission to promote music education and music appreciation in youngsters. This is why at every opportunity, performances are coupled with a master class or school program for which the quintet volunteer their time. For more ticket information, please call the CTAC office at 580-252-4160 or visit http://www.chisholmtrailarts.com.